Ok wow, I really am not sure where October went! My goal is to bring you a video each month showing my Gossamer Blue kits in a Project Life spread, and today is literally the last day of October so I better get on it for this month! 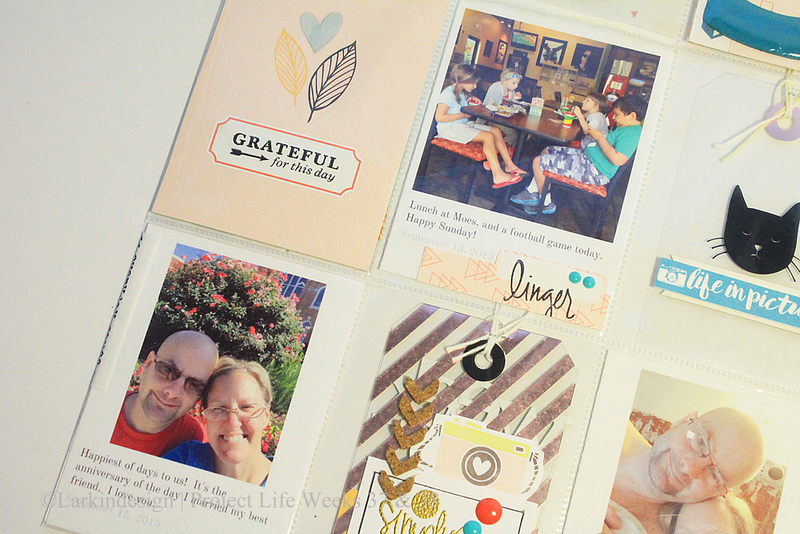 Every month I receive the Main Scrapbooking Kit and the Life Pages Kit and I love them, I love all the fun products they send, and I love the stamp sets that come with both. They always do a fantastic job putting collections together and I can’t tell you how many times I have gotten some of the products in a collection that sold out. You know what I’m talking about – the best product in the most popular collections always sell out so quick, but subscribing to GB will always get you those special items! Here is Side A, or Week 37, and notice I did not create a date card for this side. That is ok, I really wanted to highlight the fact that is was our third anniversary! You will notice I did something different on Week 38, where I used almost a full sheet of patterned paper in those pockets. I absolutely love that paper from My Mind’s Eye My Story collection, and I wanted to use it in a bigger section than just one pocket. So I decided to cut two-thirds of that paper and layer the photos and embellishments over top of it. I have to admit that I have been missing using some of those larger patterns in my Project Life, and while I was working on this layout I did some thinking about next year’s album. I am about ready to wind down this year’s album, with December Daily coming upon us, and that means a new year and a new memory keeping strategy. So I think I might start doing something similar to what I did here, using the larger patterned papers and layering photos and embellishments over top. I have a little tweaking to do, but I really like that method. 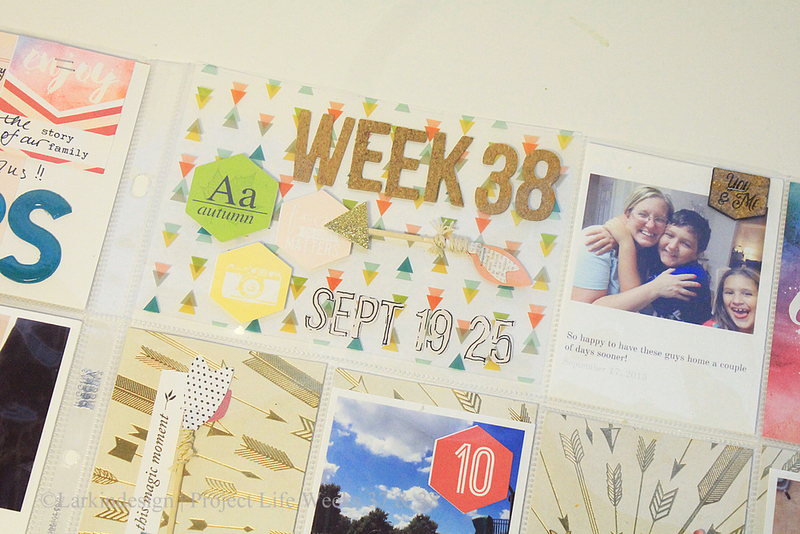 I hope you have enjoyed this week’s Project Life video! I’ll see you again soon! 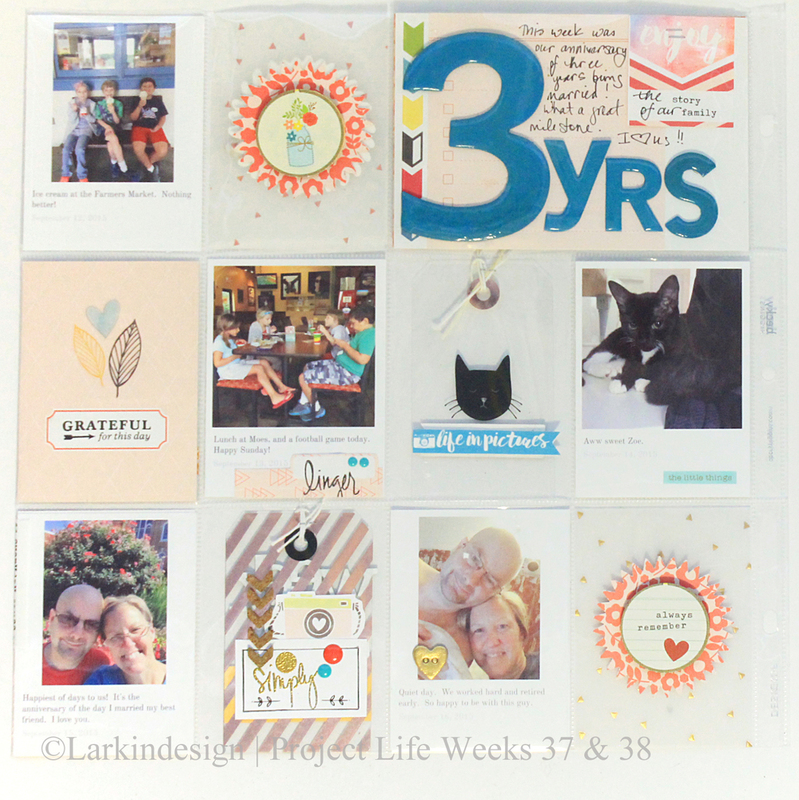 ***Project Life is a memory-keeping concept designed by Becky Higgins and marketed by American Crafts. I am not affiliated with either of them, but I do love using their products and love inspiring others to use their products as well! To find out more about Project Life and to connect with other talented scrapbookers, please visit Becky Higgins’ website. Hello and welcome back! I’m so happy to share a beautiful video today that I made showing the foundation pages of my December Daily album for this holiday season. I hope you enjoy! Alright, so that is my album for the month of December, ready to be filled with photos and stories of our Christmas 2015. I still have a few blog posts planned before December starts because I would like to post all the before photos of the album, and I would like to show you how I organize all my December supplies and papers! I hope you will check back in and be sure to Subscribe so you can get the newest posts in your inbox. Hello, welcome back! I am practically giddy with excitement for this year’s December Album, also known as December Daily, and I’m so excited to post my process video today showing how I created my cover. I posted some sneak photos of the album a few days ago and so appreciate all of you who stopped in to take a look! So without further ado, here is the process video. So I’m going to tell you that this was not the album I started with! I have mentioned before that my jumping off point for this year’s album was a series of subway numbers I found at a local vintage shop, named Vintage Jane. These numbers were 5 1/2″ wide x 5″ tall. So I created an album that was suitable for that size – and then went to put all the pages into it and realized only about 18 days would fit in it! Anyway, in the next few days I will show you what I did with the album that was almost December Daily – so stay tuned for that! Also I am working hard on finishing up the foundation pages and a walk-thru video of my December album and I hope you will Subscribe down below to get all the goodies in your inbox. Thanks so much for checking out my December album and my process video! I hope you are inspired to go, do, create! ***December Daily is a concept of creating an album and capturing one memory per day throughout the month of December. This concept was developed by scrapbooking genius and creative super power Ali Edwards. More on the project, her process, and her available products can be found here. I am not affiliated with Ali Edwards, but I do love to use her products and hope you enjoy seeing them being used. Most importantly, I hope I inspire you, as Ali has inspired me, to create awesome memories and then document those memories in a way that excites you and reminds you of all that is good in life. Hi there, I’m back today with a video of my Project Life process for Week 36, which was September 5-11, 2015. My last video can be seen here; Weeks 35 and 36 are together in my album so they sort of go together. I’ve used the same products: Crate Paper Wonder collection and Ali Edwards journaling cards, washi tape, and Stories stamp set. I will link to those products at the end of the blog post! I love this 4 x 6 card layered on top of Crate Paper’s floral pattern. I am making an effort to get some of the larger patterned papers into my Project Life spreads, and this makes me happy! This journaling card is one of my favorites, and the main reason why I chose to use the Wonder collection in both of these spreads: Ali has used that apricot color along with red and turquoise and that palette is one of my favorites! Those turquoise alphabets from Simple Stories worked out great – I love the contrast between them and the gold stripe. Also, the white and orange journaling card was originally a 4×6 size, and I cut it down vertically to fit in this pocket. Don’t be afraid to cut your elements down and try them in a different orientation! 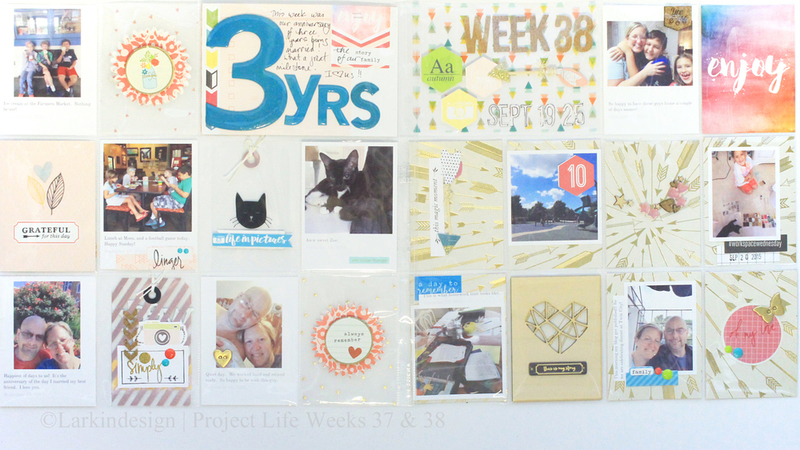 I hope you have enjoyed this simple, easy Project Life layout today! I’ll be back soon to continue the journey through my Project Life album this year! And because they are so cute, here are more shots of the kittens.